Acne is the most common skincare issue that people deal with throughout their lifetimes. Whether you have teenage hormonal acne, cystic acne, or just troubled adult skin, laser treatment for acne is an appropriate solution because it is safe, effective, and involves no harsh chemicals applied to the skin. Most people have struggled with acne at some point in their lives, so why not fight back with lasers? Acne treatment with lasers is safe, effective, and surprisingly affordable. Schedule your consultation with Anastasia to be evaluated. During your consultation, she will go over your concerns with you, examine the area to be treated (which, while often on the face, can sometimes be found the back or chest), and discuss what a realistic treatment plan will look like. For solutions to acne that really work, look no further! Our laser acne treatments target the source of your troubled skin like no other. Topical creams can only do so much when compared to laser therapy. 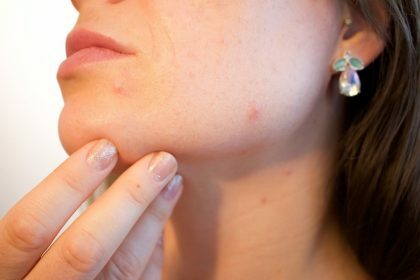 The laser works by killing the acne bacteria that actually causes your breakouts. With this preventative treatment performed every 2-4 weeks, you will see a marked improvement in your skin. First, Anastasia will cleanse the site to be treated and apply a clear gel to the area. Then, during the laser session (which will be quick; you can stop in on your lunch break or at the end of the work/school day), you will feel a light snapping on your skin. Compared to our other laser treatments, the discomfort is very mild, so no numbing is necessary. Afterwards, your skin may feel a bit more sensitive than usual. While undergoing your series of acne treatments, you will have to be mindful to minimize your sun exposure, and to avoid using harsh products that over-dry your skin. Call our office and set up your consultation with Anastasia to find out whether laser treatment for acneic or blemish-prone skin is right for you. You will need to come in for treatments every 2-4 weeks, depending on the severity of your condition. Can this treatment be performed safely on teenagers? Yes, this treatment is safe for teenagers. We will, however, require parental consent.